Metronet win prestigious WebRTC Apps competition. The WebRTC apps competition we ran in conjunction with/sponsored by GENBAND came up with three clear leaders and one eventual winner. One entry showed how WebRTC would be monetized and the others presented their solution it as an an overlay to existing support services. The eventual winner was Metronet. The judges were hugely impressed at the number of levels Metronet were able to utilize WebRTC and KANDY. The technology was used in a mobile devices, M2M connectivity to their monitoring systems and integrated into their core CRM platform. The solution also utilized messaging, file sharing, voice, video, conferencing and collaboration. Metronet have based a large amount of their success in both their Data and Voice offering on their proactive customer service and saw the potential to be able use WebRTC to grow that service commitment still further. The underlying monitoring platform was already in place so triggering a the group message to the Engineering Application from there was quite simple. 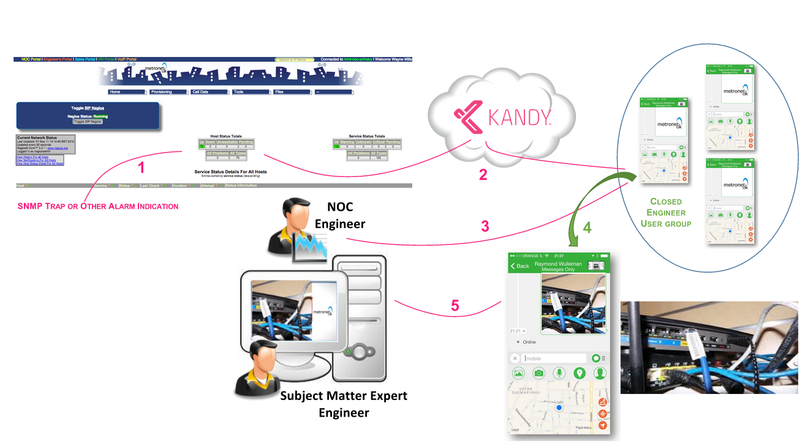 Metronet were able to use the KANDY reference mobile apps to very quickly allow the engineers access to the group from both Android and Apple mobile devices. By then adding WebRTC calling into their NOC CRM they were able to build a consolidated environment fault resolution environment for voice, video, conferencing and collaboration with the result of a “cradle to grave” resolution for faults so inevtiably improving already impressive SLAs. Everyone involved would like to congratulate Metronet for their entry and look forward to seeing more of their inventive use of the technology.